Forget “The Sisterhood of the Traveling Pants.” A real-life Stormtrooper suit is currently making the rounds amongst girls who need it -- and the results would make any Jedi proud. It started in 2010 when then 7-year-old Katie Goldman was teased for how much she liked “Star Wars.” Other kids told her that only boys could like it, and they taunted her for carrying a "Star Wars" water bottle. When Katie's mom, author and HuffPost blogger Carrie Goldman, wrote about her daughter's experience, she got the attention of a "Star Wars" fan group, 501st Legion who sent messages of support and started the hashtag #maytheforcebewithkatie. The legion even wore "Star Wars" gear in her honor. She was a viral superstar. Katie rocked that armor at her school’s Halloween parade. And again while trick-or-treating. And in spring at the Purim Carnival. 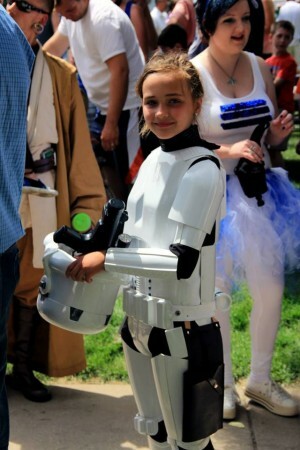 And in summer at Star Wars Day in Joliet. Getting her ready each time was a cosmic task, but the outcome was always stunning. But Katie is 11 now, and it’s time for a new girl to wear the suit. Late last year, spokesman Brian Troyan of the 501st Legion emailed Carrie with the idea. “I wonder if Katie might be ready to pass along her Stormtrooper armor to another little girl who has been bullied and who needs a little love and a reminder that she shouldn't ever need to hide who she is,” he wrote. He was referring to an 11-year-old named Allison. Katie agreed to pass along the suit without hesitation. “I was surprised, because I knew it was special to her,” her mother said. Troyan planned to give Allison the suit at an Autism Speaks event. The Friday before he came to pick it up, Katie, her sister and friends spent the afternoon writing notes to Allison to accompany the suit. Troyan told Buzzfeed that Allison couldn’t wait to try the costume on. The Stormtrooper suit's adventure won't end there. Once Allison outgrows it, the legion will work to pass the costume to another child in need of a confidence boost. “Even if someone tries to make fun of them for something, that doesn’t mean they should be ashamed of it,” he said, explaining a mantra both girls now know very well. It almost goes without saying. The Force is strong with these girls.